With more EDM acts booking Madison Square Garden for their tours, it&apos;s becoming kind of a mini-EDM mecca for the stars that can fill it. While This news shouldn&apos;t come as a surprise, word just hit the wire that Diplo and Skrillex will be headlining a massive New Year&apos;s Eve party at The Garden. This extravaganza will not only feature sets from Diplo and Skrillex separately, but they&apos;ll also be performing as Jack U. How all of this will go down is too early to say; maybe we can expect some live PA type business with a live performance of "Take Ü There" (with live vocals from Kiesza)? 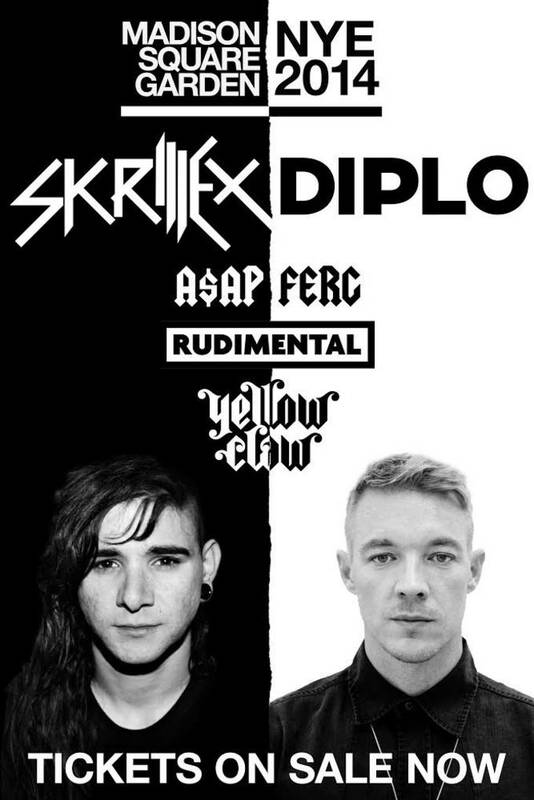 As of right now there&apos;s no word on if Diplo, Skrillex, and Jack U are the only guests booked for that night, either. What we DO know is general public ticket sales go down on Friday, September 19 at 12PM EST. If you&apos;re trying to be in New York but don&apos;t want to see the ball drop, you know where you need to be. Make your plans today! UPDATE Word just broke that Diplo and Skrillex are bringing A$AP Ferg, Rudimental, and Yellow Claw along for their massive NYE show at Madison Square Garden. Tickets are on-sale now.